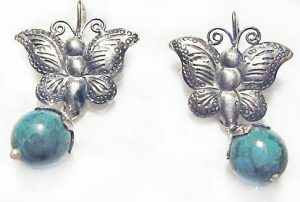 Butterfly earrings made in silver, detailed repoussé technique*. Bottom has a beautiful turquoise, that can be the one of your choice. For pierced earrings. Lightweight made in sterling sterling 925. 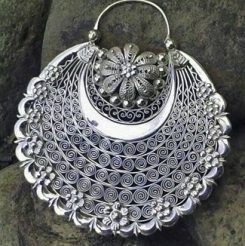 *Repoussé is a metal working technique in which metal such as silver is ornamented or shaped by hammering from the reverse side to create a design in low relief. These are awesome. 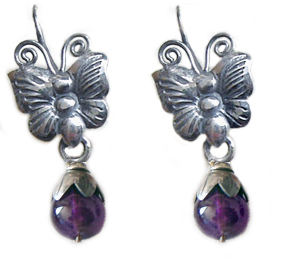 Earrings have a repousse flower on top, bottom are two hand made filigree large rings that move so graciously. 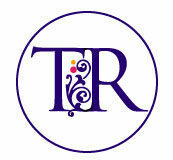 They are the perfect match for your wedding. Let us know if you need a special size. 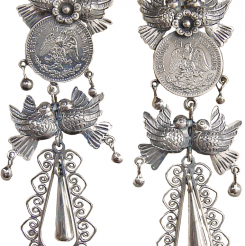 Day of the dead filigree skull earrings. 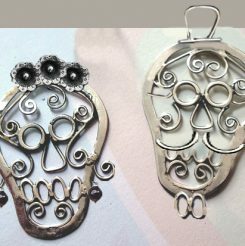 Day of the dead filigree skull earrings. 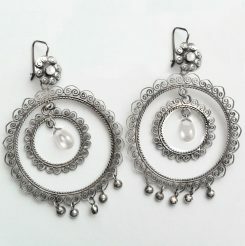 Earrings made in filigree, silver 925, light weight and very nice.